1. Purpose - Members of the American Land Title Association (ALTA) have specific needs, unique to title insurance matters, when asked to insure title to land without exception as to the many matters which might be discoverable from survey and inspection, and which are not evidenced by the public records. In order to meet such needs, clients, insurers, insureds, and lenders are entitled to rely on surveyors to conduct surveys and prepare associated plats or maps that are of a professional quality and appropriately uniform, complete and accurate. To that end, and in the interests of the general public, the surveying profession, title insurers and abstracters, the ALTA and the National Society of Professional Surveyors, Inc. (NSPS) jointly promulgate the within details and criteria setting forth a minimum standard of performance for ALTA/ACSM Land Title Surveys. A complete 2011 ALTA/ACSM Land Title Survey includes the on-site fieldwork required under Section 5 herein, the preparation of a plat or map showing the results of the fieldwork and its relationship to record documents as required under Section 6 herein, any information in Table A herein that may have been negotiated with the client, and the certification outlined in Section 7 herein. 2. Request for Survey - The client shall request the survey or arrange for the survey to be requested, and shall provide a written authorization to proceed from the person or entity responsible for paying for the survey. Unless specifically authorized in writing by the insurer, the insurer shall not be responsible for any costs associated with the preparation of the survey. The request shall specify that an "ALTA/ACSM LAND TITLE SURVEY" is required and which of the optional items listed in Table A herein, if any, are to be incorporated. Certain properties, including, but not limited to, marinas, campgrounds, trailer parks and leased areas, may present issues outside those normally encountered on an ALTA/ACSM Land Title Survey. The scope of work related to such properties should be discussed with the client, lender and insurer, and agreed upon in writing prior to requesting the survey. The client may need to secure permission for the surveyor to enter upon the property to be surveyed, adjoining properties, or offsite easements. A. Effective Date - The 2011 Minimum Standard Detail Requirements for ALTA/ACSM Land Title Surveys are effective February 23, 2011. As of that date, all previous versions of the Minimum Standard Detail Requirements for ALTA/ACSM Land Title Surveys are superseded by these standards. B. Other Requirements and Standards of Practice - Some Federal agencies, many states and some local jurisdictions have adopted statutes, administrative rules and/or ordinances that set out standards regulating the practice of surveying within their jurisdictions. In addition to the standards set forth herein, surveyors shall also conduct their surveys in accordance with all applicable jurisdictional requirements and standards of practice. Where conflicts between the standards set forth herein and any such jurisdictional requirements and standards of practice occur, the more stringent shall apply. C. The Normal Standard of Care - Surveyors should recognize that there may be unwritten local, state, and/or regional standards of care defined by the practice of the ‘prudent surveyor’ in those locales. D. Boundary Resolution - The boundary lines and corners of any property being surveyed as part of an ALTA/ACSM Land Title Survey shall be established and/or retraced in accordance with appropriate boundary law principles governed by the set of facts and evidence found in the course of performing the research and survey. E. Measurement Standards - The following measurement standards address Relative Positional Precision for the monuments or witnesses marking the corners of the surveyed property. i. “Relative Positional Precision” means the length of the semi-major axis, expressed in feet or meters, of the error ellipse representing the uncertainty due to random errors in measurements in the location of the monument, or witness, marking any corner of the surveyed property relative to the monument, or witness, marking any other corner of the surveyed property at the 95 percent confidence level (two standard deviations). Relative Positional Precision is estimated by the results of a correctly weighted least squares adjustment of the survey. ii. Any boundary lines and corners established or retraced may have uncertainties in location resulting from (1) the availability, condition, history and integrity of reference or controlling monuments, (2) ambiguities in the record descriptions or plats of the surveyed property or its adjoiners, (3) occupation or possession lines as they may differ from the written title lines, and (4) Relative Positional Precision. Of these four sources of uncertainty, only Relative Positional Precision is controllable, although due to the inherent errors in any measurement, it cannot be eliminated. The magnitude of the first three uncertainties can be projected based on evidence; Relative Positional Precision is estimated using statistical means (see Section 3.E.i. above and Section 3.E.v. below). iii. 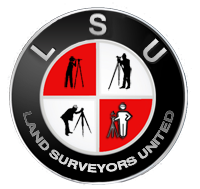 The first three of these sources of uncertainty must be weighed as part of the evidence in the determination of where, in the surveyor’s opinion, the boundary lines and corners of the surveyed property should be located (see Section 3.D. above). Relative Positional Precision is a measure of how precisely the surveyor is able to monument and report those positions; it is not a substitute for the application of proper boundary law principles. A boundary corner or line may have a small Relative Positional Precision because the survey measurements were precise, yet still be in the wrong position (i.e. inaccurate) if it was established or retraced using faulty or improper application of boundary law principles. iv. For any measurement technology or procedure used on an ALTA/ACSM Land Title Survey, the surveyor shall (1) use appropriately trained personnel, (2) compensate for systematic errors, including those associated with instrument calibration, and (3) use appropriate error propagation and measurement design theory (selecting the proper instruments, geometric layouts, and field and computational procedures) to control random errors such that the maximum allowable Relative Positional Precision outlined in Section 3.E.v. below is not exceeded. v. The maximum allowable Relative Positional Precision for an ALTA/ACSM Land Title Survey is 2 cm (0.07 feet) plus 50 parts per million (based on the direct distance between the two corners being tested). It is recognized that in certain circumstances, the size or configuration of the surveyed property, or the relief, vegetation or improvements on the surveyed property will result in survey measurements for which the maximum allowable Relative Positional Precision may be exceeded. If the maximum allowable Relative Positional Precision is exceeded, the surveyor shall note the reason as explained in Section 6.B.ix below. 4. Records Research - It is recognized that for the performance of an ALTA/ACSM Land Title Survey, the surveyor will be provided with appropriate data which can be relied upon in the preparation of the survey. The request for an ALTA/ACSM Land Title Survey shall set forth the current record description of the property to be surveyed or, in the case of an original survey, the current record description of the parent parcel that contains the property to be surveyed. Complete copies of the most recent title commitment, the current record description of the property to be surveyed (or, in the case of an original survey, the parent parcel), the current record descriptions of adjoiners, any record easements benefiting the property, the record easements or servitudes and covenants burdening the property (all hereinafter referred to collectively as "Record Documents"), documents of record referred to in the Record Documents, documents necessary to ascertain, if possible, the junior/senior relationship pursuant to Section 6.B.vii. below, and any other documents containing desired appropriate information affecting the property being surveyed, and to which the ALTA/ACSM Land Title Survey shall make reference, shall be provided to the surveyor for use in conducting the survey. Reference is made to Section 3.B. above. i. The location and description of any monuments or lines that control the boundaries of the surveyed property. ii. The location, size and type of any monuments found (or set, if Table A, Item 1 is requested by the client, or if otherwise required – see Section 3.B. above) on the boundary of the surveyed property. i. The distance from the appropriate corner or corners of the surveyed property to the nearest right of way line, if the surveyed property does not abut a right of way. ii. The name of any street, highway or other public or private way abutting the surveyed property, and the width and location of the travelled way relative to the nearest boundary line of the surveyed property. iii. Visible evidence of physical access (such as, but not limited to, curb cuts and driveways) to any abutting streets, highways or other public ways. iv. The location and character of vehicular, pedestrian or other forms of access by other than the apparent occupants of the surveyed property to or across the surveyed property, including, but not limited to driveways, alleys, private roads, sidewalks and footpaths observed in the process of conducting the survey. v. Without expressing a legal opinion as to ownership or nature, the location and extent of any potentially encroaching driveways, alleys, and other ways of access from adjoining properties onto the surveyed property observed in the process of conducting the survey. vi. Where documentation of the width or location of any abutting street, road or highway right of way was not disclosed in Record Documents provided to the surveyor or was not otherwise available from the controlling jurisdiction (see Section 6.C.iv. below), the evidence and location of parcel corners recovered which might indicate the width or location of such right of way lines. vii. Evidence of access to and from waters adjoining the surveyed property, such as paths, boat slips, launches, piers and docks observed in the process of conducting the survey. i. The character and location of evidence of possession or occupation along the perimeter of the surveyed property, both by the occupants of the surveyed property and by adjoiners, observed in the process of conducting the survey. ii. The character and location of all walls, buildings, fences, and other improvements within five feet of each side of the boundary lines, observed in the process of conducting the survey. iii. Without expressing a legal opinion as to the ownership or nature of the potential encroachment, the evidence, location and extent of potentially encroaching structural appurtenances and projections observed in the process of conducting the survey, such as fire escapes, bay windows, windows and doors that open out, flue pipes, stoops, eaves, cornices, areaways, steps, trim, etc., by or onto adjoining property, or onto rights of way, easements or setback lines disclosed in Record Documents provided to the surveyor. Based on the normal standard of care, the location of all buildings on the surveyed property shown perpendicular to the nearest perimeter boundary line(s) and expressed to the appropriate degree of precision. i. Evidence of any easements or servitudes burdening the surveyed property, disclosed in the Record Documents provided to the surveyor and observed in the process of conducting the survey. ii. Evidence of easements or servitudes not disclosed in the Record Documents provided to the surveyor, but observed in the process of conducting the survey, such as those created by roads; rights of way; water courses; ditches; drains; telephone, fiber optic lines, or electric lines; water, sewer, oil or gas pipelines on or across the surveyed property and on adjoining properties if they appear to affect the surveyed property. iii. Surface indications of underground easements or servitudes on or across the surveyed property observed in the process of conducting the survey. iv. Evidence of use of the surveyed property by other than the apparent occupants observed in the process of conducting the survey. As accurately as the evidence permits, the location of cemeteries, gravesites, and burial grounds (i) disclosed in the Record Documents provided to the surveyor, or (ii) observed in the process of conducting the survey. i. The location of springs, together with the location of ponds, lakes, streams, and rivers bordering on or running through the surveyed property, observed during the process of conducting the survey. See Table A, Item 19 for wetlands locations. ii. The location of any water boundary on the surveyed property. The attribute(s) of the water feature located (e.g. top of bank, edge of water, high water mark, etc.) should be congruent with the boundary as described in the record description or, in the case of an original survey, in the new description. (See Section 6.B.vi. below). 6. Plat or Map - A plat or map of an ALTA/ACSM Land Title Survey shall show the following information. Where dimensioning is appropriate, dimensions shall be in accordance with the appropriate standard of care. A. The evidence and locations gathered during the field work as outlined in Section 5 above. i. The current record description of the surveyed property, and any new description of the surveyed property that was prepared in conjunction with the survey, including a statement explaining why the new description was prepared. Preparation of a new description should be avoided unless deemed necessary or appropriate by the surveyor and insurer. Preparation of a new description should also generally be avoided when the record description is a lot or block in a platted, recorded subdivision. ii. The location and description of any monuments, lines or other evidence that control the boundaries of the surveyed property or that were otherwise relied upon in establishing or retracing the boundaries of the surveyed property, and the relationship of that evidence to the surveyed boundary. In some cases, this will require notes on the plat or map. iii. All distances and directions identified in the record description of the surveyed property (and in the new description, if one was prepared). Where a measured or calculated dimension differs from the record by an amount deemed significant by the surveyor, such dimension shall be shown in addition to, and differentiated from, the corresponding record dimension. iv. The directional, distance and curve data necessary to compute a mathematical closure of the surveyed boundary. A note if the record description does not mathematically close. The basis of bearings and, when it differs from the record basis, the difference. v. The remainder of any recorded lot or existing parcel, when the surveyed property is composed of only a portion of such lot or parcel, shall be graphically depicted. Such remainder does not need to be included as part of the actual survey, except to the extent necessary to locate the lines and corners of the surveyed property, and it need not be fully dimensioned or drawn at the same scale as the surveyed property. vi. When the surveyed property includes a water boundary, a note on the face of the plat or map noting the date the boundary was measured, which attribute(s) of the water feature was/were located, and the caveat that the boundary is subject to change due to natural causes and that it may or may not represent the actual location of the limit of title. When the surveyor is aware of natural or artificial realignments or changes in such boundaries, the extent of those changes and facts shall be shown or explained. vii. The relationship of the boundaries of the surveyed property (i.e. contiguity, gaps, or overlaps) with its adjoiners, where ascertainable from Record Documents and/or from field evidence gathered during the process of conducting the survey of the property being surveyed. If the surveyed property is composed of multiple parcels, the extent of any gaps or overlaps between those parcels shall be identified. Where gaps or overlaps are identified, the surveyor shall, prior to preparation of the final plat or map, disclose this to the insurer and client for determination of a course of action concerning junior/senior rights. viii. 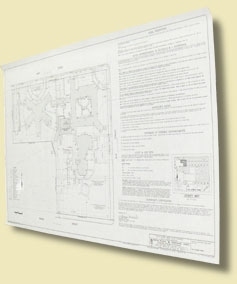 When, in the opinion of the surveyor, the results of the survey differ significantly from the record, or if a fundamental decision related to the boundary resolution is not clearly reflected on the plat or map, the surveyor shall explain this information with notes on the face of the plat or map. ix. A note on the face of the plat or map explaining the site conditions that resulted in a Relative Positional Precision that exceeds the maximum allowed under Section 3.E.v. of these standards. x. A note on the face of the plat or map identifying the title commitment/policy number, effective date and name of the insurer for any title work provided to the surveyor. i. The width and recording information of all plottable rights of way, easements and servitudes burdening and benefitting the property surveyed, as evidenced by Record Documents which have been provided to the surveyor. ii. A note regarding any right of way, easement or servitude evidenced by a Record Document which has been provided to the surveyor (a) the location of which cannot be determined from the record document, or (b) of which there was no observed evidence at the time of the survey, or (c) that is a blanket easement, or (d) that is not on, or does not touch, the surveyed property, or (e) that limits access to an otherwise abutting right of way, or (f) in cases where the surveyed property is composed of multiple parcels, which of such parcels the various rights of way, easements, and servitudes cross. iii. A note if no physical access to a public way was observed in the process of conducting the survey. iv. The width of abutting rights of way and the source of such information (a) where available from the controlling jurisdiction or (b) where disclosed in Record Documents provided to the surveyor. v. The identifying titles of all recorded plats, filed maps, right of way maps, or similar documents which the survey represents, wholly or in part, with their recording or filing data. vi. For non-platted adjoining land, names and recording data identifying adjoining owners according to current public records. For platted adjoining land, the recording data of the subdivision plat. vii. Platted setback or building restriction lines which appear on recorded subdivision plats or which were disclosed in Record Documents provided to the surveyor. i. The plat or map shall be drawn on a sheet of not less than 8 ½ by 11 inches in size at a legible, standard engineering scale, with that scale clearly indicated in words or numbers and with a graphic scale. When recordation or filing of a plat or map is required by law, such plat or map shall be produced in recordable form. The boundary of the surveyed property drawn in a manner that distinguishes it from other lines on the plat or map. A north arrow (with north to the top of the drawing when practicable), a legend of symbols and abbreviations, and a vicinity map showing the property in reference to nearby highway(s) or major street intersection(s). ii. Supplementary or detail diagrams when necessary. iii. If there are no visible buildings on the surveyed property, a note stating “No buildings existing on the surveyed property” shall appear on the face on the survey. iv. The surveyor’s project number (if any), and the name, registration or license number, signature, seal, street address, telephone number, and email address of the surveyor who performed the survey. The date(s) of any revisions made by said surveyor. v. Sheet numbers where the plat or map is composed of more than one sheet. This is to certify that this map or plat and the survey on which it is based were made in accordance with the 2011 Minimum Standard Detail Requirements for ALTA/ACSM Land Title Surveys, jointly established and adopted by ALTA and NSPS, and includes Items of Table A thereof. The field work was completed on ___________. 8. Deliverables - The surveyor shall furnish copies of the plat or map of survey to the insurer and client, and as otherwise negotiated with the client. Hard copies shall be on durable and dimensionally stable material of a quality standard acceptable to the insurer. Digital copies of the plat or map may be provided in addition to, or in lieu of, hard copies in accordance with the terms of the contract. When required by law or requested by the client, the plat or map shall be produced in recordable form and recorded or filed in the appropriate office or with the appropriate agency. 1. _____ Monuments placed (or a reference monument or witness to the corner) at all major corners of the boundary of the property, unless already marked or referenced by existing monuments or witnesses. 2. _____ Address(es) if disclosed in Record Documents, or observed while conducting the survey. 5. _____ Vertical relief with the source of information (e.g. ground survey or aerial map), contour interval, datum, and originating benchmark identified. 6. _____ (a) Current zoning classification, as provided by the insurer. _____ (b) Current zoning classification and building setback requirements, height and floor space area restrictions as set forth in that classification, as provided by the insurer. If none, so state. 8. _____ Substantial features observed in the process of conducting the survey (in addition to the improvements and features required under Section 5 above) such as parking lots, billboards, signs, swimming pools, landscaped areas, etc. 9. _____ Striping, number and type (e.g. handicapped, motorcycle, regular, etc.) of parking spaces in parking areas, lots and structures. 10. _____ (a) Determination of the relationship and location of certain division or party walls designated by the client with respect to adjoining properties (client to obtain necessary permissions). _____ (b) Determination of whether certain walls designated by the client are plumb (client to obtain necessary permissions). _____ (b) Observed evidence together with evidence from plans obtained from utility companies or provided by client, and markings by utility companies and other appropriate sources (with reference as to the source of information). · utility company installations on the surveyed property. Note - With regard to Table A, item 11(b), source information from plans and markings will be combined with observed evidence of utilities to develop a view of those underground utilities. However, lacking excavation, the exact location of underground features cannot be accurately, completely and reliably depicted. Where additional or more detailed information is required, the client is advised that excavation may be necessary. 12. _____ Governmental Agency survey-related requirements as specified by the client, such as for HUD surveys, and surveys for leases on Bureau of Land Management managed lands. 13. _____ Names of adjoining owners of platted lands according to current public records. 14. _____ Distance to the nearest intersecting street as specified by the client. 15. _____ Rectified orthophotography, photogrammetric mapping, airborne/mobile laser scanning and other similar products, tools or technologies as the basis for the showing the location of certain features (excluding boundaries) where ground measurements are not otherwise necessary to locate those features to an appropriate and acceptable accuracy relative to a nearby boundary. The surveyor shall (a) discuss the ramifications of such methodologies (e.g. the potential precision and completeness of the data gathered thereby) with the insurer, lender and client prior to the performance of the survey and, (b) place a note on the face of the survey explaining the source, date, precision and other relevant qualifications of any such data. 16. _____ Observed evidence of current earth moving work, building construction or building additions. 17. _____ Proposed changes in street right of way lines, if information is available from the controlling jurisdiction. Observed evidence of recent street or sidewalk construction or repairs. 18. _____ Observed evidence of site use as a solid waste dump, sump or sanitary landfill. 19. _____ Location of wetland areas as delineated by appropriate authorities. 20. _____ (a) Locate improvements within any offsite easements or servitudes benefitting the surveyed property that are disclosed in the Record Documents provided to the surveyor and that are observed in the process of conducting the survey (client to obtain necessary permissions). _____ (b) Monuments placed (or a reference monument or witness to the corner) at all major corners of any offsite easements or servitudes benefitting the surveyed property and disclosed in Record Documents provided to the surveyor (client to obtain necessary permissions). 21. _____ Professional Liability Insurance policy obtained by the surveyor in the minimum amount of $____________ to be in effect throughout the contract term. Certificate of Insurance to be furnished upon request. Adopted by the Board of Governors, American Land Title Association, on October 13, 2010. Adopted by the Board of Directors, National Society of Professional Surveyors, on November 15, 2010.